Leaders at the Climate Vulnerable Forum called on world’s governments to raise the ambition of their climate targets by 2020 in order to save vulnerable nations threatened by warming beyond 1.5 degrees Celsius. The CVF is being held in Marshall Islands. Through the summit’s “Jumemmej Declaration”, the forum’s leaders committed to strengthening their national climate efforts by 2020 in order to pressure world governments to act. “Jumemmej” is a Marshallese word of seafaring origin calling for vigilance to keep a watch against threats. The carbon-free summit brought together leaders of the Climate Vulnerable Forum (CVF), which represents many of the countries most threatened by climate change. More than 40 heads of state, government and delegation also constituted the first global gathering of leaders of nations most threatened by climate change. The Bilateral KONKAN exercise is marks the naval cooperation between India and the United Kingdom based on the long term strategic relationship. The KONKAN series of exercises commenced in 2004, and since then has grown in scale. The Indian Navy will field INS Kolkata, the first ship of latest Kolkata class destroyers, equipped with integral Seaking and an IN submarine. The thrust of the exercise this year would be on Anti-Air warfare, Anti-Surface Warfare, Anti-Submarine Warfare, Visit Board Search and Seizure (VBSS) and Seamanship Evolutions. The Minister informed that as many as 2.1 crore connections have been released under Saubhagya so far. Nation is expected to achieve 100% saturation in the country by 31st December, 2018. For creating healthy competition amongst various DISCOMs, an award scheme has been instituted with awards of more than Rs 300 crore to be won by States/Discoms. The first DISCOM/Power Departments to complete 100% household electrification will be felicitated with cash award of Rs. 50 Lakh for the employees and Rs.100 crore grant to be spent for distribution infrastructure. For the purpose of award, States have been divided into 3 categories and award would be given in each of these categories. The States completing 100% household electrification by 31st 2018 will also receive additional grant of 15% of the project cost (5% for special category States) sanctioned under Saubhagya. The Indian Owl Festival, the country’s first owl fest, will be held at Pingori village in Purandar taluka of Pune, Maharashtra. The two-day festival is organised by Ela Foundation, an NGO working towards nature education and conservation. It will give information on owl conservation and feature art forms like pictures, paintings, lanterns, lamp shades, posters, origami, stitched articles, poems and stories on owls. Of the 262 species of owls that are found in the world, 75 feature in the red data book — meaning they are threatened. Major causes behind this are superstitions and habitat loss, both are man-made. Owls eat rats, rodents, bandicoots, and mice. Most of the species that owls consume are harmful to agricultural croplands. So these birds are actually very beneficial to farmers. According to a report published by Traffic India, a wildlife trade monitoring body, and the World Wildlife Fund (WWF) in 2010, owls were found to be consumed and traded for a wide variety of purposes, including black magic, street performances, taxidermy, private aviaries/zoos, food and in folk medicines. Despite being protected under the Wildlife (Protection) Act of India, the report has found owls to be highly prized and in demand for black magic purposes. Women are paid the most unequally in India, compared to men, when it comes to hourly wages for labour. On average, women are paid 34 per cent less than men, a recent report by the International Labour Organization (ILO) has found. This gap in wages, known as the gender wage gap, is the highest among 73 countries studied in the report. This gender wage gap has remained unchanged at 20 per cent from 2016 to 2017. 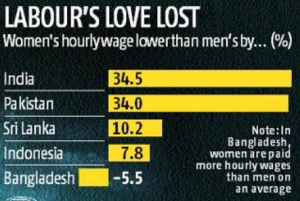 Women are paid higher hourly wages than men in Bangladesh. In advanced economies (G20), real wage growth declined from 0.9 per cent in 2016 to 0.4 per cent in 2017, meaning near stagnation. By contrast, in emerging economies and developing G20 countries, real wage growth dipped marginally from 4.9 per cent in 2016 and 4.3 per cent in 2017. These findings are presented in the flagship publication of the ILO, the Global Wage Report 2018-19, which was released on November 26. The trend holds true globally as well. Inequality is higher in monthly wages, with a gap of 22 per cent. In real terms (adjusted for price inflation), global wage growth declined to 1.8 per cent in 2017, from 2.4 per cent in 2016. The findings are based on the data from 136 countries. Overall, real wages grew just 1.8 per cent globally (136 countries) in 2017. In most countries, women and men differ significantly in respect of working time – specifically, that part-time work is more prevalent among women than among men. But in 2017, the gender gap was accompanied by a near-stagnation in wages. Real wage growth has been the lowest since 2008, the year of the financial crisis. With empirical evidence that gender wage gap is visible even with women with higher levels of education, the report advocated that emphasis needs to be placed on ensuring equal pay for women and men. How does gene modification work? India and Germany look back on decades of successful bilateral relations. Mother and Child Health – Immunization Program, BPBB, PMJSY, PMMSY, etc. Mains Paper 3: Economy | Inclusive growth & issues arising from it. The Inclusive Wealth Report 2018 shows that while overall global wealth is rising, the increase for many countries comes at the expense of environmental assets, such as water, clean air, forests and biodiversity. A country’s inclusive wealth is the social value (not dollar price) of all its capital assets, including natural capital, human capital and produced capital. The IWR 2018 builds on previous versions of the report (IWR2012 and IWR 2014) and advances methods of measuring the base of economy- capital of all types. It covers the period from 1990 to 2014, which is 25 years, which provides us with a picture of the changes in capital assets over almost a generation. It is biennially released by UNEP, that seeks to evaluate and report on a country’s wealth and wellbeing. IWI is a tool assessing a nation’s ability to look after its wealth in a way that is sustainable and safeguards its future generations. The Inclusive wealth (IW) in 135 countries was higher in 2014 compared to the level in 1990 and the global growth rate of IW was 44% over the indicated period. This implies an average growth rate of 1.8% per year. However, during the same period the global GDP growth per year was 3.4%, which is close to twofold of the annual growth rate of growth in IW. The global level growth of each of the three capitals over the study period indicate that produced capital was growing at an average rate of 3.8% per year and health and education induced human capital was growing at 2.1%. Contrary, natural capital was decreasing at a rate of 0.7% per annum. The structure of capital at the global scale as of 2014 has composed of produced capital (21%), human capital (59% of which 26% education induced human capital and 33% is health induced human capital), and natural capital (20%). By this measure, 44 of the 140 countries – more than a third – ranked in the report’s Inclusive Wealth Index have declined in inclusive wealth per head since 1998, even though GDP has increased in many of them. The report explores alternatives to using Gross Domestic Product (GDP) as a measure of a country’s wealth. It says that GDP measures the size of a country’s economy but not its underlying asset base. Instead, it uses inclusive wealth, which focuses on stocks of manufactured, human and natural capital. The health of an economy must be drawn from the health of the environment. To make the right choices that will keep us on a sustainable path, we have to be able to properly measure our progress. This report will equip policy-makers with the right numbers, so that they can make the right decisions to deliver results for generations to come. Water deficits will increase and intensify in India in 2019, says the latest edition of Global Water Monitor & Forecast Watch List. The report is presented by IScience (US based LLC) states the findings from the latest Water Security Indicator Model (WSIM). ISciences Water Security Indicator Model (WSIM) monitors and forecasts water anomalies on a near global basis. WSIM includes algorithms to assess the impacts of water anomalies on people, agriculture and electricity generation. WSIM has been run continuously since April 2011 and has been validated against subsequent monitoring based on observed data. The forecast predicts severe to exceptional surplus water for regions including Jammu and Kashmir, Himachal Pradesh, Uttar Pradesh and Mizoram. Moderate to severe deficits were forecast for Bihar. From February through April, deficits in India are expected to moderate overall and some regions in the country’s eastern third will normalize. However, intense deficits will persist throughout Gujarat and Madhya Pradesh and along the Tungabhadra River through Karnataka. The forecast for the final months — May through July (2019) — indicates primarily moderate deficits in India and pockets throughout the region. Though this September’s extreme heat was unrelated to El Niño which usually introduces warm dry conditions. El Niño is being blamed for low rainfall during the June-to-September monsoon season. The monsoon rain deficits have caused drought-like conditions in almost a third of Indian districts, and added stress for the farmers. India’s coffee production is expected to fall to its lowest in five years due to flood damage to plantations in southern states such as Kerala and Karnataka. India exports about three quarters of the coffee it produces, and flood damage has been reported in all key producing areas of the country. The High Level Empowered Committee (HLEC) set up by Government of India in July 2018 came out with its report on stranded thermal power projects. The Committee has assessed the landscape of these stranded assets and identified the various reasons that have contributed to the current scenario. This report focused on 34 thermal power stations, totalling to a capacity of 40 gigawatt (GW), which are entirely fuelled by coal and lignite. Institutional challenges related to the issue have contributed to the problem. The envisaged a capacity addition requirement of 88 GW was surpassed with 99 GW during the corresponding period leading plants to perform below their rated capacities. Several root causes identified by the HLEC are interconnected with the debt burden of the distribution utilities and the financial stress on banks/financial institutions as well as promoters and bidders. A significant chunk of the problem has been caused by the erratic coal supply and the uncertainty of coal supplies due to scrapping of mine auctions by the Supreme Court. HLEC has put forth suggestions, most of which are in line with current government policies to help power plants in general and stressed assets in particular. Coal supply is an inter-ministerial issue, whereby the ministries for coal and railways have been requested to work out mechanisms to address short-term issues of supply. Linking coal supply to power plant efficiency is a good way to incentivise better, newer and more efficient assets. Old plants operating way past their lifetime are less efficient in resource utilization, have higher emission profiles and are also expensive due to swift recovery of renovation costs that keep adding on to them. Several measures related to power markets to address the financial risks have been strongly recommended by the HLEC. These include getting NTPC or any other agency to act as an aggregator for power purchases, which can subsequently be sold to distribution utilities. The idea is not new as Power Finance Corporation (PFC) had recently conducted a tender for procuring 2500 megawatt (MW) of thermal power from stranded assets under specific conditions. Many promoters are facing National Company Law Tribunal (NCLT) for defaults, and their assets are also online for sale. Any new owner of a power plant should not be subjected to these challenges of obtaining clearances and signing agreements again, else the interest to acquire the asset may wane. The talk to revive gas power plants is important, and serves good purpose as natural gas is a relatively cleaner fuel with lesser emissions. However, gas supply will continue to remain a problem for several reasons. Priority of supply of natural gas has always been lopsided to fertiliser industry, which uses natural gas as raw material and has a strong government presence and control. The political economy of gas supply and pricing will be heavily determined by this emerging consumer base as well. Even if imported, the lack of sufficient LNG storage terminal capacity and subsequent pipeline capacity will ensure that things remain more of the same in the near future. Therefore, these are mere platitudes unless a strong position is taken on reviving the fortunes of these power stations. The HLEC has shown that ways can be found to sort out the mess within the thermal power sector for coal fired power plants. However, the sole focus on coal has meant that gas-based power plants will have to wait for their turn under the sun. The ISRO has successfully launched the PSLV-C43/HysIS mission from the Satish Dhawan Space Centre in Sriharikota late. This mission, the sixth one this year that will use a polar satellite launch vehicle (PSLV), will see the launch of HysIS – India’s own earth observation satellite. The satellite will be accompanied by 29 other satellites developed by various nations, including 23 from the US. The PSLV launcher has a total length of 39.4m and consists of a four-stage rocket, that has alternating solid and liquid stages. PSLV-C43 is a core-alone version of the launch vehicle, and the lightest one in operation. The combined weight of the satellites is 641.5kg. PSLV-C43 mission’s payload consists of the HysIS satellite, one micro-satellite and 29 nano satellites. While the 30 foreign satellites will be launched at an altitude of 504 km from the Earth’s surface, ISRO’s HysIS satellite will be launched at an altitude of 636 km. The satellite will be put into a polar synchronous orbit, which sets it in motion along the axis that runs along the Earth’s geographic North and South Pole. HysIS stands for Hyper Spectral Imaging Satellite. The objective of the probe is to provide observations within the visible, near infrared and shortwave infrared bands of the electromagnetic spectrum. The imaging tools will help the HysIS satellite monitor atmospheric activity and climate change, while also assisting studies of Earth’s magnetic field. These observations will have a host of applications, prime among which relate to agriculture, forestry, water management, and coastal patterns. The satellite’s payload also consists of a 730W power backup, and a 64Ah Li-ion battery. It will continue to make observations till 2023, when the mission ends. After this launch, the next big event for the Indian space organisation will be its awaited mission to the moon – Chandrayaan-2 – in early 2019. Mains level: Need for pan-India emergency response system. The Union Home Ministry has launched Emergency Response Support System (ERSS) for Himachal Pradesh. Central Government has allocated ₹321.69 Crore under Nirbhaya Fund for implementation of ERSS project across the country. Under this project, a single number based 112 emergency services which will connect to Police, Fire, Health and other help lines through an Emergency Response Centre in the State. The service also includes a ‘112 India’ mobile app integrated with Panic Button of smartphones and ERSS State website for ease of citizen in availing immediate assistance. To increase the effectiveness of Emergency Response, the ERC has also been integrated with Location Based Services provided by Telecom Service Providers. Himachal Pradesh is the first state to launch pan-India single emergency number ‘112’ under ERSS. To ensure safety of women, a SHOUT feature has been introduced in ‘112 India’ mobile app. It helps seek immediate assistance from registered volunteers in the vicinity apart from the immediate assistance from Emergency Response Centre. The government will take a fresh look at modernizing the Income Tax Act, 1961, after an earlier effort by a six-member task force got derailed. The new direct tax law is expected to make taxation more progressive, wherein the tax burden will be higher on those with better payment capacity. This approach was evident in the government’s choice of tax rates when it reformed indirect taxation by ushering in the goods and services tax (GST). Luxury items are subject to the highest rate of 28%-plus cess and mass use items are either exempted or are kept in the 5% GST slab, although a four-slab system risked making GST more complex. The task force is however, unlikely to propose the difficult-to-implement inheritance tax. Although it may be easier to say that one should tax the rich more, implementing an inheritance tax is complex. It can only lead to high-income earners getting resettled elsewhere. The union government has appointed a task force, which will advise the government on drafting a new direct tax law that suits India’s economic requirements. The government has so far attempted to phase out corporate tax concessions, reduce corporate tax rates for small businesses to 25% and give relief to small income earners by lowering tax rates. The government also plugged some of the massively abused loopholes in the bilateral tax treaties with Mauritius to prevent tax-evaded money coming back into the country in the form of foreign direct investment.